Dr. Tucker Gilman, a post-doctoral fellow at NIMBioS and lead author of a new study in Nature, explains how multiple traits in host-parasite interactions give the host a unique evolutionary advantage that helps it survive. In nature, how do host species survive parasite attacks? This has not been well understood, until now. A new mathematical model shows that when a host and its parasite each have multiple traits governing their interaction, the host has a unique evolutionary advantage that helps it survive. The results are important because they might help explain how humans as well as plants and animals evolve to withstand parasite onslaught. 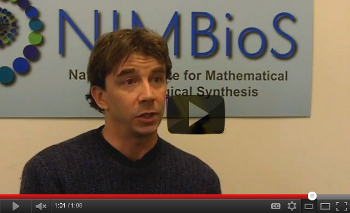 The research, reported in the March 4 online edition of Nature, was supported by the National Institute for Mathematical and Biological Synthesis (NIMBioS) and the National Science Foundation. The paper was co-authored by Tucker Gilman, a postdoctoral fellow at NIMBioS; Scott Nuismer, an associate professor of biology at the University of Idaho; and Tony Jhwueng, a former postdoctoral fellow at NIMBioS. Evolutionary theory suggests that parasites and pathogens should evolve more rapidly than their hosts because they tend to have shorter generation times and often experience strong selection. But this creates a paradox: How can hosts, or "victim species," survive and even thrive despite continuous onslaught from more rapidly evolving parasitic enemies? "In order to investigate the influence of the number of traits on coevolution, we used quantitative genetics and individual-based simulations to analyze a model of a victim-exploiter system," Gilman said. "We were able to show that when multiple traits, not just a single trait, govern how the hosts and parasites interact, victims can gain the upper hand in the evolutionary arms race." In nature, interactions between species are often influenced by multiple traits. 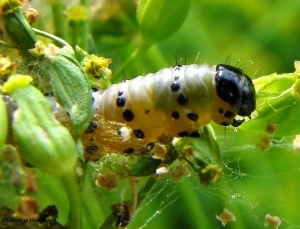 For example, the resistance of wild parsnip to webworm attack depends on when the parsnip blooms and on concentrations of certain chemical compounds with insecticidal properties found in the plant. Similarly, teleost fish, such as tuna and halibut, have multiple defensive traits such as mucosal barriers and biocidal secretions that parasites must overcome in order to successfully infect the host. "While the study focuses on host-parasite systems," Gilman said, "the results are general to any victim-exploiter pair. For example, in a predator-prey system, the predator has to first find, then capture, and finally subdue its victims, and a victim can deploy defensive traits at each stage of the attack." Having multiple attack and defensive mechanisms may help prey species to evolve and maintain low interaction rates with their predators, according to the paper. In addition, the finding suggests that coevolution of multiple traits may help plants to limit the damage they receive from herbivores, and so may help to explain why the world is green. Citation: Gilman RT, Nuismer SL, Dwueng D-C. 2012. Coevolution in multidimensional trait space favors escape from parasites and pathogens. Nature. [Online].